My first attempt was some beachy signs. I found the signs at the thrift store for 25 and 49 cents. And yes I was up at 7 am on a Saturday painting signs and the sun was beating in like you would not believe! This one I even added some beachy stamps in gray. So whattya think? Wanna visit the beach? These will be making the trip to the cabin very soon…please turn your head while I jump up and down in anticipation. 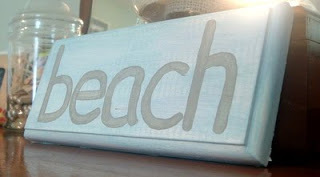 Want more beach decor finds? Try this wall art made from driftwood or this bathroom with a beach theme! You have a very steady hand. Your lettering is very neat! 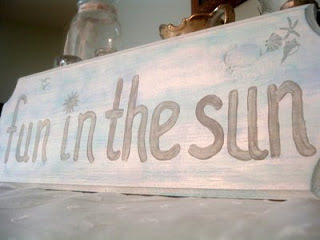 They are very cute signs and I really like the colors…very beachy! im loving the fun in the sun-mostly because it would look great in my home! 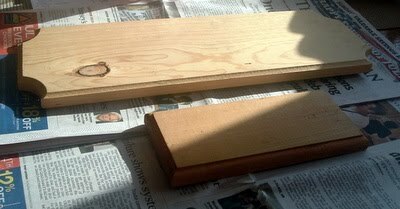 you are too crafty girl! Free hand! I can’t do anything free hand! Cute! I find it amazing that you can freehand painted letters that well!! i’m very impressed with your freehanding. i’ve got a few signs that i want to make (including a beach one), but i’m nervous about painting them by hand. 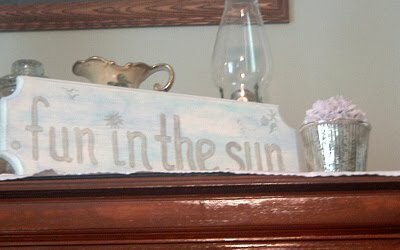 Hi there….I loving making signs for my house…and gifts. 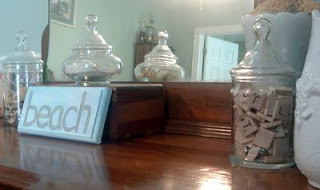 Do you buy the beachy stamps – I love those..! When you say thrift store what store do you mean?